Healthcare organizations and medical centers are responsible for ensuring the safety of employees, patients, and visitors. During an emergency, it is critical to get information out in a timely and reliable manner. From employee-only notifications to facility-wide announcements, getting the right message to the right recipients without panicking patients and exceeding building noise standards is critical. Many healthcare facilities utilize overhead paging systems and organizational phone directories to communicate with employees; however, these limited methods often fail to reach all intended personnel. Alertus provides a solution that capitalizes on existing infrastructure while enhancing overall emergency communication efforts. Healthcare facilities face certain emergency scenarios that require internal emergency notification to staff to avoid mass panic among patients. Using a net-centric system is a fast, reliable way to send specific and impactful alerts to targeted audiences without distressing patients or visitors. Alertus Desktop Notification allows medical centers to quickly notify all or select hospital personnel in the event of an emergency, or for non-emergency communications using full-screen or partial-screen computer desktop pop-ups. The Alertus VoIP Phone Notification technology allows you to simultaneously activate audible, visual notifications on all or select VoIP phones and speakers. It also works alongside Alertus Desktop Notification and other Alertus net-centric alerting endpoints to ensure consistent, enterprise-wide notifications. Healthcare facilities experience the ultimate challenge of preventing panic among patients during an emergency. Alertus’ solutions can be customized to notify healthcare professionals without alarming patients by interfacing with fire panels to both activate and distribute emergency alerts. The Alertus Fire Alarm Control Panel Interface takes fire alarm event information from the fire panel, applies smart logic/transformation technologies, and broadcasts messages over multiple communication paths. It can send targeted messages using innovative text-to-speech technology to PA systems, trigger Desktop Notifications, and more. The Alertus Fire Panel Interface allows the Alertus system to monitor and instruct the fire panel to suppress notification modalities such as strobes and sirens for certain emergency situations to help minimize noise levels. The interface is NFPA 72 compliant. Alert Beacons®, a unique wall-mounted appliance with audible visual alerting and integrated message display, can be utilized at security kiosks, information desks, nurse call stations, patient operating rooms, and other strategic locations. In an emergency, Alert Beacons and Alertus Desktop Notification instantly alert hospital staff without causing the mass panic of patients that would result from an alert broadcast over the public address (PA) system, or even a disguised “coded” alert. By leveraging every alerting method and device available, such as desktop computers, VoIP phones, digital signage, mobile devices, fire panels and more, the Alertus System creates a multilayered, unified notification system that can be activated with one click of a button. Our net-centric alerting system incorporates web-based management and alert activation application through which all operators and administrators can gain access to the system’s capabilities based on the user's permissions. 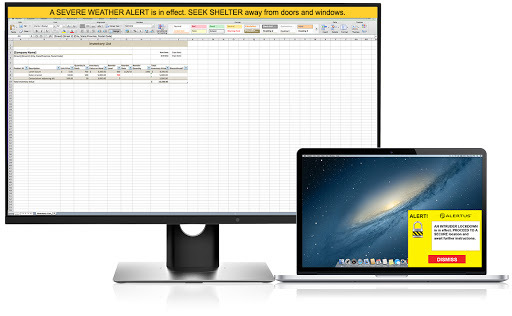 The Alertus System can easily be scaled to an organization or facilities' specific needs, making it one the most flexible, yet powerful unified emergency mass notification systems available.